IDC/Games, δωρεάν online MMO παιχνίδια. MMORPG,MOBA,RTS... Τα καλύτερα παιχνίδια browser και client. Αποκτήστε IDCCoins για όλα τα παιχνίδια. Εγγραφείτε δωρεάν τώρα! Join Cosmic League and take part in amazing PVP battles with your characters. Join the League, fight to obtain Cosmic Pieces and become the strongest in the Galaxy! 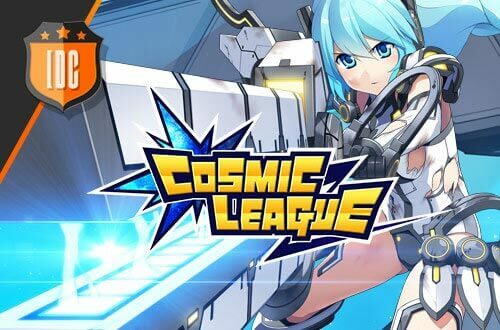 Cosmic League, the new versión of the famous Cosmic Break, known in Japan as Cosmic Break 2 is an online shooter full of action. It takes place in arenas and has cute girls and murderous robots as the main characters. In this MMO, two teams of up to 10 players battle each other in an arena designed to give you a most exciting experience. The constantly changing battlefield will force you to be always on guard and adapt your strategies to the changes. Though a multitude of varied civilizations exist, scattered throughout the galaxies, two in particular have garnered universal attention. The first were the Humes, an organic species whose techology and adaptability have allowed them to prosper. The other are robots who, despite being inorganic metallic lifeforms, possess similar values to Humes. Their combined love for sports and combat have led to the foundation of the Cosmic League, a galactic-scale battle event. The League draws participants from across the universe. The strongest of the strong test their mettle against each other. Those who come to fight and those who come to cheer them on do so out of necessity. What they desire is not wealth, nor is it fame... but the Cosmo Piece...a miraculous material capable of granting one's heartfelt desire. Choose your main character from amongst six different classes and take part in exciting PVP battles. Fight to obtain Cosmic Pieces try to drain the Enemy Team’s battle points before your own resources die out. Become a fighter in the Cosmic League and be the strongest in the Galaxy, enjoy the amazing graphics of this third-person game and characters designed in Japanese Anime-style. Enter the Cosmic League and participate in unforgettable battles! Want to receive latest news & offers?